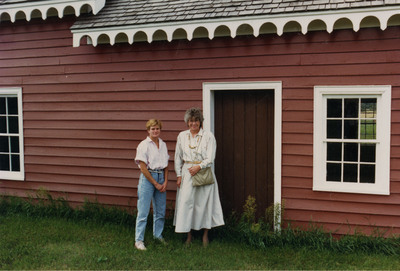 "Visiting the Antoine Gingras House"
Rosemarie Myrdal and Kathy Stremick, Director of Economic Development for the city of Walhalla, standing in front of the Antoine Gingras House near Walhalla, North Dakota. Antoine Gingras was one of the first fur traders who established a trading post at Pembina during the 1840s. A shrewd businessman, he expanded his business to include a chain of trading posts ranging from North Dakota to Manitoba.